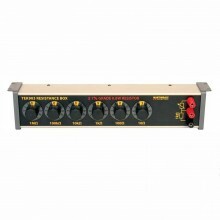 The TEK904 is an accurate and reliable seven decade resistance box with high quality rotary switches that provide in-line readouts. The Martindale TEK904 decade box adds an extra decade at the bottom of the range making for an exceptionally wide range for such a compact instrument. The seven variable decades of this resistance box are 1Ω, 10Ω, 100Ω, 1kΩ, 10kΩ, 100kΩ & 1MΩ. Resistance 1% grade 0.6 W per resistor variable from 1 Ω to 11.1111 MΩ in 7 decades. Typical Residual (Zero) Resistance <150 mΩ. Operating Environment 0 to 50°C at <70% RH. Dimensions 345 x 71 x 51 mm. 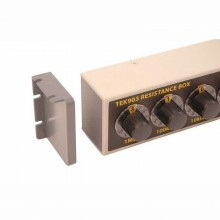 PDF Specifications of the Martindale TEK903 & TEK904 Decade Resistance Boxes.